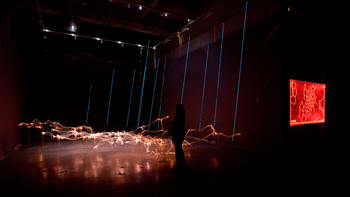 The Quasar Series (2007- 2013), which included Quasar, Quasar 2: Star Incubator, and Quasar 3 [danger du zero], was an iteration of immersive interactive light and sound installations that explore the world that exists beyond our senses by converging light and sound events in a tangible architectonic sculptural object. The name of the series is derived from a more or less mysterious astronomical occurrence, called quasars, and are understood as extremely ancient and highly luminous events that occur in the furthest known reaches in our known Universe. The significance of quasars to the work is that they represent the edge of what can be seen and known, they are a demarcation of our epistemological horizon. The main body of the installations were designed as an immersive landscape that formed a visually striking array of crystalline-like elements and fibre optic strands and acrylic structural elements that were supported by an intricate metallic substructure, whose form was inspired by quantum loops. 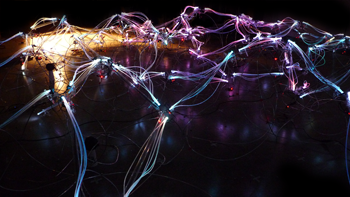 The sculpture was embedded with scores of microcontrollers that controlled hundreds of LED’s that would light up the fibre optic strands independently. 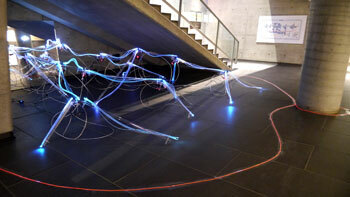 Sensors in the exhibition space would draw data from the installation’s surroundings and a multi-channel sound system integrated in the body gave a voice to the installation’s virtual life processes. The data fields connected to Quasar were collected from a variety of sources that range spatially from very distant celestial to intimately local, and temporally in scope from years of data collection to the instantaneous event. Southern California Institute of Architecture, Art Gallery January 25th – March 9th, 2008, Los Angeles, California.